Rarely do I, and I’m sure most of you are included in this as well, come across an iPod gadget that actually looks like it hasn’t been done before. And if you doubt me, just look, there are pages upon pages of speaker systems, docks, chargers, and cables. This isn’t an iPod karaoke machine, but it is one big, wireless speaker with an iPod dock and more. The microphone included is supposedly pro-quality, but I wouldn’t be expecting to get some super fancy microphone. 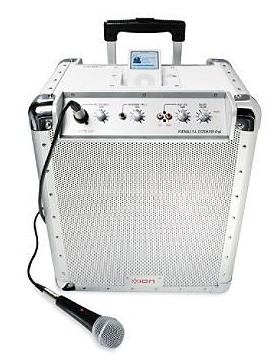 While I said this isn’t a karaoke machine, you could technically sing along with the microphone plugged in. If you’re not an iPod guy/gal, you can use the mini jack to plug in your, *gasp*, CD Player or other types of MP3 players. And if you’re simply not a recorded music type of person, you could even hook up your instrument and use the speaker for that. Battery life is pretty much average. At full volume, you can expect to get 6 hours of music playback, and at lower volumes, you can get even more. If you do have an outlet handy though, it would be a good idea to use the power cord to charge it (which can be done when it’s operating). There’s also suitcase-style wheels and a handle built into the speaker for easy portability. At $300, this gadget isn’t exactly cheap, but you are getting one nice looking (and wireless) speaker with the ability to serve as a PA system or a music player for your iPod, CD player, or even your instrument.